I think the competition was a great way for some of our most competitive players to get more experience not just playing with a highly skilled and competitive team, but also against some really tough competition in some very tight games. With few chances to play interstate throughout the year, the chance to play against the top players of Victoria and Queensland is invaluable for both our A and B players, both in preparation for QUAFL and also getting used to the competitive and focused mindset required for tight, SWIM, high stakes gameplay. We’re really proud of having developed an extremely cohesive, trusting, and hard-working team over the course of the year. We’ve pushed the team hard with additional squad trainings throughout the season, with people motivated to turn up and train hard even in the most inclement of conditions. One of the things we’re particularly proud of as well this year is the work that especially Courtney [Buckley] and Sam [Chittenden] have done in encouraging female ball-handling in the chaser game, and the strength and depth of our female chaser lines is one of the main strengths of our team now. On pitch everyone trusts and backs each other, and off pitch we have a really fun club/team culture. By far our greatest achievement as a team though is the fact that Brandon [Frisson] now actually passes. As I’ve alluded to above, we’ve been plagued by injuries all year. At the start of the year, we lost one of our newest recruits, Gunny [Gunewardene], to a broken ankle. Following this, we had Nick “The Fridge” Albornoz fall to a torn knee ligament, Mirjana Stancic out with an eye injury, Max Brenner out with a fractured wrist, and both of our captains affected by injuries at various points as well – Sam with hip issues after a rough tackle, and me dislocating my ankle – just to name a few of the physical injuries. With so many ups and downs through the year, it’s been a tumultuous year, and a lot to manage. Nevertheless, the team has clearly pulled through each and every hurdle so far and continued to exceed all expectations, and we’re going to hit the ground running at QUAFL. While some of the Unspeakables will be moving on at the end of the year, a substantial core of excellent players across all positions, alongside some absurdly talented Unbreakables who have been playing at an Unspeakables for a long time, will ensure that the team continues to be one of the most competitive in the NQL. The presidency of the club is also in the new hands of Ava McConnell, who this year acted as the Director for our Internal league. Backed by an experienced and capable executive, the club is in extremely good hands to continue to consolidate what we’ve done over the last few years with the expansion of the competitive side of the club, as well as our internal league, and continue to expand in the future. 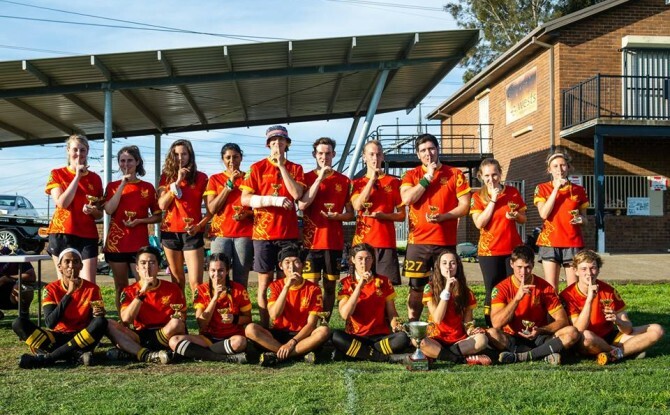 It’s only onwards and upwards from here for Usyd Quidditch. #SixTeamsAndAMovie.